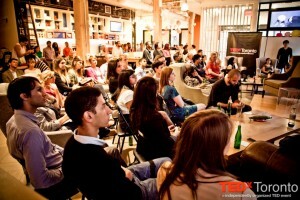 Tomorrow, The Theatre Centre will host an official TEDxToronto viewing party. This is a no-cost event with FREE LUNCH to watch and discuss the Ted Talks that will be broadcast live from The Sony Centre. Anytime from 9am – 5pm you can drop by throughout the various talks. We’re hoping to learn something new, meet other interested people, and just hang out to think and chat about the concepts a day of exploring challenging ideas inspires in us. The Theatre Centre will also be live-streaming TEDx tweets at the venue and on The Theatre Centre blog for people who want to know what we’re talking/thinking about, but can’t make it. Our stream will include tweets using #TEDxToronto as well as our venue specific tag #TEDxTOTC – for if you want to say something specific to The Theatre Centre crowd or experience. If you ARE coming by at lunch time (noon -1:30pm) – we ask that you register so we know how much food to get. If you aren’t coming at lunch –just drop on by. You can register by clicking here. Be sure to select “The Theatre Centre Pop-Up” from the pop up menu at the bottom of the page. Here’s the list of speakers with intro videos. Here’s the schedule for the day. Filed under TEDxToronto, Theatre Centre. « Want help writing a successful grant application?